Built in a clearing surrounded by trees and ponds on a 2,000-acre ranch in Big Timber, Montana, this house looks more like a private retreat than a family residence. The landscape is spectacular: a river intersects the plot of land, spring-fed ponds and lush green vegetation make up the garden, and mountains seem to rise in the distance to meet the sky. As the river changes throughout the year and threatens to flood the land, the Hughes Umbanhowar Architects studio raised the entire structure on a 30-inch-high plinth. This measure protects the building from flooding by ensuring the river safely flows underneath the foundation and around the house, but also makes the structure look like it’s floating on water. The outdoor areas were designed by landscape architect Raymond Jungles, and include a low bridge over the water leading to the entrance, small cascades, riparian plants, stepping stones throughout the garden, and saplings planted around the home. The house is made of two sections built in a T-shape; the single story section clad in wood contains the kitchen, family room, bedrooms, bathrooms, and a garage, all connected by a corridor meant to “recall the scale and function of the shed-covered walkways in former frontier towns”, as the studio explains. The more compact perpendicular volume contains the living room which boasts glazed walls on three sides. A staircase leads to the master bedroom upstairs, where expansive windows offer gorgeous views of the natural landscape. Interior designer Michelle Andrews added a striking four-sided fireplace in the common area and a suspended one in a bedroom, choosing a warm palette for the furnishings to complement the reclaimed wood surfaces, locally quarried limestone floors and timber flooring. 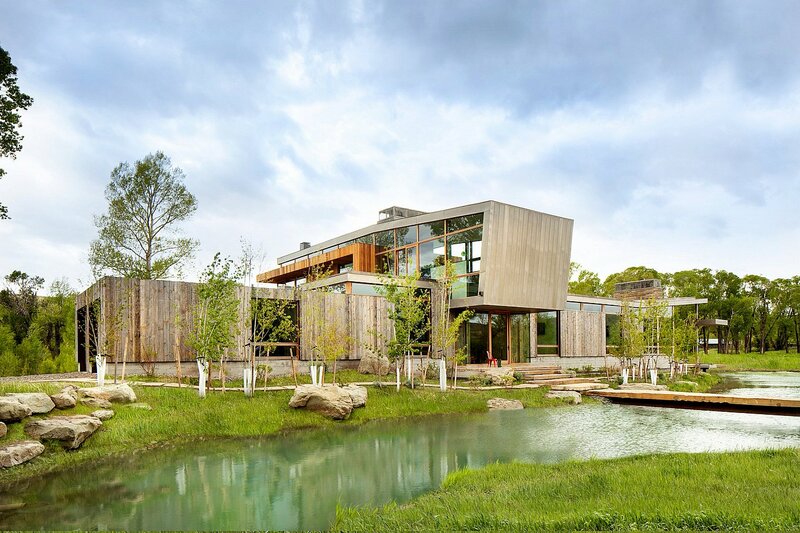 Airy, sleek and close to nature, the Big Timber Riverside Residence is truly a special place to call home. Photo credits: Hughes Umbanhowar Architects.